Danny Anderson , 27 December 2012. First, let me begin by offering my gratitude to the folks that operate Christian Humanist. I’m flattered that they would entrust a portion of their web space to me and I hope that I don’t embarrass them too badly. Just as a brief introduction, my name is Danny Anderson and I teach English at Emmanuel College in Franklin Springs, Georgia. Second, a little background on this project. Like so many other admirers, I felt more than a little bit of sadness when Philip Roth announced his retirement from novel-writing. A very quick Google search will, no doubt, provide countless eulogies to the writer and his now completed work, with the sheer volume indicating his importance in American letters. My own interest in Roth’s work has been both professional and personal and his packing away the Olivetti seemed to me to be an occasion to reflect as well. I quickly decided against any attempt to use the occasion to contribute to Roth scholarship, however. In contemplating his retirement and my own reaction to it, I realized that I found the moment to be more personally profound than professionally engaging. Roth’s novels have seared themselves into my consciousness and contributed to how I see the world (for better and worse, I suppose). When my parents or in-laws drive me crazy at a family function (not that that ever happens of course), Alexander Portnoy’s complaints about his chaotic “House of Atreus” provide me with the vocabulary to process my own frustration. Similarly, as a teacher at a small, liberal arts college, whenever I feel Words I May Regret approach my lips during a class, it is The Human Stain‘s Coleman Silk, not the faculty handbook that comes to mind. So, I decided to use this sad occasion to read through Roth’s novels in order and offer my personal reflections on my upstart blog, The Arnoldian Project. I shared my idea with friend and colleague Nathan Gilmour, and he kindly proposed I make use of this space as a privileged guest blogger instead, so here we are. I have no professional agenda here, so I don’t have a posting schedule in mind. I am simply going to read for pleasure (perish the thought!) and provide my reflections as they come to me. I don’t plan on skipping any of the novels (not even the one with the episode with the liver), but given the religious bent of this blog, I will make every attempt to be respectful of my audience. So. Roth’s first novel immediately established him as an important voice in American letters, and deservedly so. Though published in 1959, the novella strikes me as still fresh and engaging, and this, I think, is Roth’s main virtue when he is at his best. His intense focus on the particulars of the situation he writes about creates a world that lives beyond its specific moment in time. The Newark, New Jersey that Roth re-creates in this and many of his novels is factually gone (its Jews having left for the suburbs long ago), but somehow maintains its vitality and reality in the details Roth molds, both lovingly and cruelly, into literary art. Like all great art then, Roth’s best fiction transcends the immediate circumstances of its origin and creates an imaginary space where what is really true can live on and become available to readers beyond that particular circumstance. Feel free to draw on your own favorite truisms about the Universal and the Particular here. The story is quite simple, unlike many Roth narratives. A young Jewish man from working class Newark, Neil Klugman, becomes infatuated with Brenda Patimkin, the beautiful daughter of a wealthy Jewish family that has managed to escape the dirt and ethnic legacy of the old city and move to the wealthy New Jersey suburbs. A summer romance and artistic soul searching blossom from the protagonist’s desire. There is a series of conflations here, all of which point toward postmodern metafiction; Neil with the image of Neil, Neil’s image with the library, and finally Neil, a fictional creation, juxtaposed against volumes of books. Furthermore, that “wall of books” that seemingly contain the fictional Neil is “broken,” giving a strong sense of permeability between the world of fiction and the world we call “real.” These images offer a kind of prelude to the metafiction that defines the majority of Roth’s later work, and here the seeds are in a spare story of a 50’s summer romance at the very beginning of Roth’s career. In fact, Roth’s unrelenting exploration of metafiction has always been, for me at least, the most engaging element of his work, both intellectually and emotionally. In the prolonged intensity of this artistic focus, Roth’s fiction asserts that our lives are not simply a series of facts to be processed and put behind us, but narrative material to be experienced again and again. This has profound religious implications. Christians live the life of faith largely through a sacred book, which provides a never-ending spring of divine inspiration for living. Our deep spiritual need for narrative extends beyond the Bible, as well. The more we consider the truth and the beauty of the Sistene Chapel, for instance, the deeper its truths permeate our lives. This disciplined, never-ending process of contemplation enriches our perspectives on every aspect of our lives. And, like Neil Klugman’s “broken wall of books,” it indicates a deep connection between our lives and the stories we tell ourselves. In other words, our imaginations are inexorably connected with the so-called “real world.” Roth’s insistence upon the primacy of the imagination in the well-considered life deeply resonates with my values as a man, a teacher, and a Christian. Revisiting Goodbye, Columbus has also deepened my current thinking about Christian culture. I happen to be reading James K. A. Smith’s book Desiring the Kingdom, and I couldn’t help but see a connection between its claims and the questions Roth’s book raises for its reader. Smith’s concern is with Christian education, particularly its ends. He argues against focusing our educational efforts around what he calls “worldview” perspectives. In essence, he claims that human beings are not primarily “thinking” animals, but “desiring” ones. Therefore, Christian education cannot simply be about providing subjects with the “correct” information so they reject falsehoods, but should instead strive to orient students’ desires so that the whole of their actions and learning will be directed toward the ultimate good. I find the book compelling, and it speaks directly toward the cultural questions I currently have about Christendom. Perhaps I’m inappropriately reading it into Goodbye, Columbus then, but I cannot help but see Neil’s ultimate question as one of not knowledge, but desire. Here we see Neil’s mind actively focused not primarily on knowledge or information about correct moral action, but rather on the nature of his desire. Neil, the highly intelligent philosophy graduate of Rutgers University, approaches these questions not from perspective of one seeking technical information, but as a philosopher asking about the Good. First of all, let’s not gloss over the humor of this scene – the book is very funny after all, and we should appreciate that. Life isn’t all about seriousness, and neither is Roth. Coming to God with the question “how carnal can I get,” is an example of well-placed comic relief that keeps the novel from becoming obnoxiously intellectual and self-absorbed. However, the question of where to turn one’s “acquisitiveness” could come straight out of Smith’s own mediation and it should provide material for all seekers of truth to ponder for an extended period of time. A lifetime ideally. The fact that Roth’s first novel opens up a living, meditative space in which we can dwell on the great philosophical questions that Smith raises 50 years later is a testament to its greatness. This leads me to my final reflection on re-reading the novel. Unlike the work of many writers of realism (say Steinbeck or Dreiser), Roth’s work provides its readers . . . is it still elitist and presumptuous to say “us?” . . . with no easy conclusions that we can quickly assimilate and apply to our lives. For instance, I have used the occasion of reading Goodbye, Columbus to reflect on a few matters that concern me as a Christian, but I can in no way assert that there is a vision of Orthodox Christianity hidden in its pages. There is no ideological position that the novel seeks to validate, in fact. The reader, we, are tempted to scorn the Patimkin family and their shallow materialism. Their devotion to athletics, status, and their country club offer us an opportunity to assume a position of righteous sanctimony. The righteousness of this sentiment, however, is undermined by Neil’s own flawed motivations. Neil’s juxtaposition against the Patimkin father offers a good example of the novella’s complexity. At one point, Neil is in the brutish Mr. Patimkin’s office and the patriarch looks over his warehouse floor and somewhat cruelly reflects on what he perceives to be his college-educated children’s weak idealism. If we are meant to think less of him for this, we must also think less of the philosophically minded Neil, who similarly disregards Brenda’s idealism by pressuring her into obtaining the birth control device. Their conflict is less one of sexual freedom than of the mechanization of love. Neil is no athlete and in fact disdains the Patimkins’ application of competitive athletics to every aspect of life. But when he reflects in his prayer that the “race is to the swift,” he essentially admits to applying the coldly calculating perspective of athletics to his relationship with Brenda. In the scene at the Patimkin warehouse then, Neil and Mr. Patimkin seem to me to be doubled, and the flaws of the wealthy suburbanite are no greater than those of the working class, urban philosopher. All in all, the story refuses to provide any kind of closure. We aren’t necessarily led to solely identify with any one character or worldview, as each is flawed and seems all the more real for it. Without any cheap and easy answers to difficult problems, the story puts the reader in a position where thinking and experiencing life in all its richness and complexity is required. This to me provides something of value for all of us. Not all of Roth’s work is of equal quality, of course. There will be moments in this process when I expect I will be irritated. Our Gang comes to mind, but who knows? Perhaps my initial impression of that weaker novel will be proven inadequate. 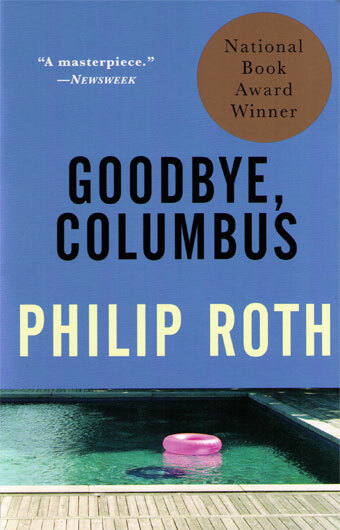 Reading Goodbye, Columbus again makes me excited to continue this re-visitation of our great Roth, warts and all. It has reminded me that reading literature, at its best, removes us from the immediate circumstances of our world and provides us brief contact with something eternal and sometimes even divine, though that contact may be at times difficult, unsettling, and challenging. This transcendent moment enriches our lives so that we can feel life more richly wherever we experience it.